As "Pianissimo" seems to have been well received by listeners, we have put in some work to extend it for as long as currently possible, covering almost all of the suitable piano recordings in the twentysound archives. In addition to the composers and works below, we were able to add Shostakovich's "24 Preludes and Fugues" op.84, in two versions (Tatjana Nikolajeva and Keith Jarrett, the famous jazz pianist), and other cyclical works centered around the number 24, like his 24 Preludes, the 24 Preludes by Wsewolod Zaderatsky and the 24 Marginalien by Jaan Rääts. Important other additions are "Ludus tonalis" by Paul Hindemith and some "Studies for Player Piano" by Conlon Nancarrow. Finally, some pieces by Robert Schumann, not at all 20th century, were added, a recording by Cecile Licad, rarely heard but well-known for her recording of Rachmaninov's Second Piano Concerto. With these additions, the Pianissimo series now contains 35 broadcasts, and its first broadcast will end on March 10th. After a longer break, we finally found some time to create many new broadcasts. In addition to new "Afternoon Concerts", "Regions" and "Orchestral Works" programs, we have created a new program series, "Pianissimo", which is dedicated to piano music (and which does not only contain very soft music). Well represented are Russian composers like Shostakovich or Rachmaninov, but also composers like Ravel, Chopin or Ciurlionis. Also included are artists positioned somewhere between classical and popular music, like Antonija Pacek and Didier Squiban. The program series will be played for the next two weeks at 10pm, in place of the "Evening Sounds". It will be extended in the future. We are looking forward to your feedback! Like last year, twentysound will be broadcasting a special Advent program, with modern and traditional Christmas music. The "Advent Calendar" of the ORA singers has been augmented with their new CD "The Mystery of Christmas" and with "Christmas in the Valleys", several Welsh choirs performing Christmas classics. New additions to the Advent program are also a "Christmas Symphony" by the American composer William Henry Fry and choral works by Charles Villiers Stanford. The two hour program will be broadcast each day at 8pm (Berlin time), and repeated after midnight. On the weekends, we will also broadcast it at 8am in the morning. We wish you a peaceful Christmas season! Our planned 3 new Special Programs are now ready and will be played in the next 8 weeks in the Symphonies slot starting at 6pm Berlin time, "Movie Sounds" on Fridays, "Modern Women" on Saturdays and "Romantic Roots" on Sundays. Our two older Special Programs, the Remembrance - World Wars series and the "Classic Jazz" programs, will be broadcast again, too, on Wednesdays and Thursdays. The incentive for "Movie Sounds" was that two very important Russian composers, Dimitri Shostakovich and Alfred Schnittke, dedicated a good part of their time to composing music for the movies. Shostakovich's film music has been present in our portfolio for quite some time, Schnittke's is a more recent addition. There are some other composers who actually came from the film music field, like Miklos Rozsa or Nino Rota or are closely associated with it like Wolfgang Korngold. Famous more recent composers like Howard Shore, John Williams or John Barry are also represented. Our program mixes short pieces and whole film music suites, although of course no complete film musics. The "Modern Women" program is the most diverse of the new programs, as it contains works from all regions and all periods, wildly mixed. Many important female composers come from Russia, like Galina Ustvolskaya, Sofija Gubaidulina or Alla Pavlova. Another region where women composers are often found is the U.S., with Gloria Coates or Amy Beach. Frangis Ali-Zadeh and Onute Narbutaite represent countries from the former USSR, while Grazyna Bacewicz or Ljubica Maric represent East European countries. There is a bit of a gap in our portfolio for Western Europe, but we have Grete von Zieritz or Ruth Zechlin representing Germany and the Boulanger sisters France. Finally, Australia offers several interesting female composers like Elena Kats-Chernin, Margaret Sutherland or Miriam Hyde. Our third new program, "Romantic Roots", was motivated by a number of excellent recordings in our archives covering the great Romantic and Classic composers. Many of those recordings are CD's from the 1980's, Deutsche Grammophon classics, but also Philips, Supraphon or Eterna CD's from the years before 1990 - classic early CD's are kind of a side hobby for me. These recordings are contrasted with matching modern works, e.g. Bruckner's Fourth with Rautavaara's Third Symphony, or Dvorak's Cello Concerto with Martinu's Rhapsody-Concerto. Sometime the connection is a bit hidden - Beethoven's Seventh Symphony is contrasted with Ernst Hermann Meyer's Symphony in B, the connection being that Meyer, a GDR composer, wrote an essay deriving that Beethoven was an early Revolutionary, basically a forerunner of socialist composers! All of these new Special Programs will be extended - there are many fitting works in our archives waiting to be included in them in the future. But if you have suggestions for these programs, please contact us! The new arrivals of the first quarter of 2018 are high in number (about 60 CD's) and also in diversity, which can be seen in the New Arrivals series starting on Saturday April 21st, broadcast in the place of the "Symphonies" at 6 p.m. Berlin time. The range of works extends from Film Music (e.g. John Barry's "James Bond" themes, Miklos Rosza classical or Alfred Schnittkes more modern sounds), relaxed piano music from Antonija Pacek and Enrico Vallone, romantic works like Antonin Dvorak's Cello Concerto, up to a number of modern concertos from Mantovani, Schoeller or Zahnhausen. Details regarding these new programs will follow. We have to thank for donations coming from the Kurt Schwaen archive which will extend our "Musical Region GDR" programs, from Antonija Pacek and from Enrico Vallone for recordings of their piano compositions which will be presented in our "Relaxed Morning" program, and from Navona Music and Albany Records, both contributing much to the planned "Modern Women" program. And of course thanks to the support by R.M., especially in regards to the Violin Concertos of Florence B. Price! The most exotic work acquired in the last few months is a symphony, the "Long March Symphony" by the Chinese composer Ding Shan-de, a rare and valuable CD from 1984 I stumbled over in a second-hand CD shop in Stuttgart. Looking around in second-hand CD shops is real fun, and discovering rarities at good prices doubly so! Supplementing the publication of the article, twentysound will broadcast, from December 25th to 31st, 7 programs from the Musical Regions series, all dedicated to East German composers including, of course, Kurt Schwaen. The app also supports podcasts. Due to copyright reasons, we cannot broadcast music via podcasts, but we could produce programs on selected composers, or also interviews. Ideas or even contributions from our listeners are highly welcome! Christmas is approaching! To calm those who fear the stress and hectic of the Christmas season, and to add to your festive mood, we have created 24 two hours Christmas programs which will be broadcast from December 1st to December 24th. The idea to the program came from the ORA singers in the UK who produced 24 choral works, one for each day of the Advent season, composed by renowned contemporary composers, partially even commissioned by the choir. We play these works twice during the program - the first time right at the beginning and the second time towards the end. These works are complemented with other modern Christmas compositions, many of those choral or organ works, but also symphonic pieces, e.g. by Respighi or various British composers. The two hours programs will be broadcast at 6 p.m. starting on December 1st, and repeated at midnight (Berlin time) to accommodate U.S. listeners. In the week from Nov. 19th to November 25th, we repeat our "Remembrance" program first broadcast in summer, in which composers are remembered who fell or were murdered in World War I and II. Also played are works which relate to these wars. The program is played in place of our "Modern Symphonies" slot starting at 6 p.m.. Right in time for the beginning of the 4th quarter of 2017, we have completed the upload of our new arrivals from the third quarter. The most noteworthy addition has been a donation from the Kurt Schwaen archive , for which we are really thankful! We received a number of CDs of the German composer Kurt Schwaen (1909 - 2007) who was one of the most prominent composers of former East Germany. His compositional style is easy to understand and fits well into the twentysound portfolio. Other additions like Frederick Delius, Eric Fogg or Charles Tournemire stem from recommendations by our listener and advisor R.M., and one, with Guitar music from Peter Sculthorpe and Nigel Westlake, actually from a notice I wrote to myself, about 20 years ago, which I stumbled over this summer. For works from the U.S. composers Michael Kurek and Sergio Cervetti and the Czech composer Jan Jirasek, we have to thank Navona Music again! Michael Kurek's "The Sea Knows" seems to be a bestseller amongst modern classical music in the U.S.. Finally, a number of additions of Spanish and South American music, with composers like Salvador Bacarisse, Radamés Gnattali or Heitor Villa-Lobos, are the result of some travelling in northern Spain in September. The 7 "New Arrivals" programs will be played from Monday Oct 2nd. to Sunday Oct. 8th, in the "Modern Symphonies" slot at 6:00 p.m. CEST and will be repeated after Midnight of the following day. On October 9th, we will also select programs with works from Kurt Schwaen for various slots as that day is the 10th anniversary of his death. Today, most programs will contain works of the German composer Wilhelm Killmayer, who died on August 20th, one day before his 90th birthday. His 2nd and 3rd symphonies will be played in our Modern Symphonies programs over the next two days. In the week from 17.7. to 23.7., we will play works from composers who fell in World War I or II (like Rudi Stephan, Cecil Coles, Alberic Magnard or Enrique Granados), who were murdered (like Gideon Klein or Hans Krasa) or driven into exile (like Paul Hindemith or Berthold Goldschmidt). In addition, we will play compositions referring to the wars and their consequences. They will be played in the time slot of the "Regions" series (10:00 a.m -2:00 p.m and 0:00-4:00 a.m.). Covering the new acquisitions of the second quarter of 2017, 8 "New Arrivals" slots will be played in the "Regions" time slot, starting at 10am (CEST) and being repeated after midnight for listeners from other regions. One focal point are late 19th / early 20th century Russian composers like Reinhold Glieré, Boris Asafiev, Dmitri Kabalevsky, Nikolai Medtner, Anatoly Liadov and Alexander Krein (the last 3 recommended by R.M. ), another the Austrian composer Erich Wolfgang Korngold, with both his classical and his movie compositions. Also, additional works of two German composers who have been our favourites for a long time, Tilo Medek and Harald Genzmer, have been obtained and will be presented in this series and of course in the general program. The New Arrivals of the first quarter of 2017 contain many works of American composers like Sergio Cervetti, Jeffrey Jacob, Jay C. Batzner, Anna Elana Cohen and Edie Hill, thanks to support by Parma / Navona and Albany Music. Several works of classic American composers like the minimalist Philipp Glass or George Gershwin have also been added to the portfolio, as well as works from Mohammed Fairouz, an American composer of Arab descend who I actually discovered because I read an interesting political essay written by him, mentioning as a footnote that he is a well known composer, too! Another discovery is the Canadian-Italian composer Giacomo Cataldo. Several short symphonic works from him will be presented in the New Arrivals series and of course in our normal programs. Other noteworthy additions are works by Shostakovich's teacher Maximilian Steinberg and a number of concerts of the Czech composer Viktor Kalabis. Finally, I would like to mention some very interesting recommendations of R.M., works by Cecil Coles, Ralph Vaughan Williams and Herbert Howells, all related to the experience with World War I, or in Coles' case his death during the war. These recordings and thoughs about related experiences and losses like Rudi Stefan led to the idea to create a number of Special Programs dedicated to those composers who lost their life in WW I or who reflected their experiences of the war in their compositions. Those programs are currently in preparation. The "New Arrivals" will be presented in 13 two hour slots, starting on April 12 at 10:00 p.m., repeated on the following day at 4:00 a.m..
After some delay, we have been able to complete the upload of a number of CDs obtained in the last 6 months. The additions contain string quartets by Frank Bridge and William Walton (the latter purchased personally in Waltons villa on Ischia, Italy, situated in a beautiful park! ), symphonies by the American composers William Grant Still, Albert Hurwit and Bernard Herman, orchestral works by the French composers Vincent d'Indy and Alexandre Tansman. Thanks to Parma Recordings, fascinating works for choir ("Cadence" / Navona) and for orchestra ("Intersections" / Ansonica) by various American composers were added to the program. And we want to thank Albany Music for highly interesting CDs, e.g. with works for Marimba by Anders Koppel and others ("Zamiki"/Equilibrium) and with songs by Moondog ("Round the World of Sound" / New World Recordings). The selections above owe much to the efforts and suggestions of our staunch supporter R.M.! The new arrivals have now been added to our regular program slots. We will also replace the Regions program for the coming week by a "New Arrivals" slot covering the above works plus a number of recordings added in spring. twentysound now has their own advertising postcard! On the address side, you are being greeted by Shostakovich, Martinu and Ustvolskaya, while on the picture side our station logo is used as eye catcher and disc cover. Unluckily the texts on the address side are currently only in German, but if you wish, we will send you a number of postcards for free - please contact us! Starting on May 17th, we are introducing a slight change in our program schedule. The core programs "Musical Regions", "Afternoon Concerts" and "Modern Symphonies" are now starting one hour later, which allows us to extend the "Relaxed Morning" program to four hours. This program will be enriched in the next few weeks, mostly with relaxing jazz music from all over the world. The weekend program will now be scheduled the same way as the weekday program. I hope that the twentysound listeners will enjoy the new program schedule! You may know that on December 8th, we celebrate the 150th birthday of Jean Sibelius, surely the most important Finnish composer whose work bridged Romantic and Modern music. To honour him, all "Symphonies" programs will contain one of his symphonies from 7.12. - 13.12., and we will play a Finland program each Tuesday and Thursday for the next 3 weeks in the "Regions" slot, each of course containing at least 2 works from Sibelius. But that is not all for Northern music. We have just added a number of Danish works to our portfolio. In this collection, we stumbled over an unique Danish family, the Koppel family, with 3 composers and a number of important musicians. Herman David Koppel, born to Polish-Jewish immigrants in 1908, was a versatile pianist and composer whose symphonies deserve rediscovery. His sons Thomas and Anders both became composers and instrumentalists, his daugthers Lone and Therese a Soprano and a pianist. In the new Danmark programs slated for Monday, December 7th, Wednesday 9th and Friday 11th, we will play symphonies by Herman D. Koppel and concertos by Thomas and Anders Koppel. By the way, Anders Koppels Saxophone concertos will be played by his son Benjamin Koppel. 3 generations of musicians, this is quite unique! On the next 3 Sundays, starting November 22th, our "Modern Symphonies" program at 5 p.m. CET will be replaced by "Classical Jazz", a Special Feature in 3 parts, looking at the interaction of classical music with Jazz. A number of 20th century composers have written works in a Jazz-based style. Dimitri Shostakovich, George Antheil and Erwin Schulhoff are the most well-known coming from the "classical" side, but of course George Gershwin comes to mind here. He bridges the "classical" world to the "popular" world of musicals with composers like Irving Berlin, Jerome Kern or Cole Porter. Many of the works by Gershwin, Berlin, Kern and Porter featured in these broadcasts will be played by a violin duo consisting of Yehudi Menuhin and Stéphane Grappelli. Two African-American composers of this period, James P. Johnson and William Levi Dawson, offer another perspective on the combination of classical music with Jazz and Blues melodies. After the war, composers sometimes combined Jazz and Classical styles in solo concertos, like the pianist-composer Friedrich Gulda, Bernhard Krol (father of my music teacher at school) or Rolf Liebermann. The Finnish composer Timo Alakotila combines jazz, folk music and classical styles in his works, and the Australian composer Michael Easton refers back to Gershwin with his "Australian in Paris". Finally, the currently strongest jazz-classical voice comes from Leipzig, Germany - Stephan König, who has composed several "jazzy" piano concertos, 3 of which, together with a number of other works, will be featured in this series. Addendum - as we forgot to exchange the program for December 6th, "Classical Jazz III" will be played on December 13th and repeated after midnight on December 14th. And good news - we added a "Classical Jazz IV" program, slated for December 20th, stretching our playlist to the utmost and finally including the two Jazz Suites by Shostakovich in the orchestral version. In the last week of October and in November 2015, we will dedicate the "Musical Regions" program on Tuesday and Thursday to Italy! A country which is also not always sunny, as I found out during a short vacation end of September. The musical culture of Italy is overshadowed by its Opera composers and by its impressive history of Baroque music. During the 20th century, Italian music culture had seemingly fallen back in comparison to its past. The most well known composer is Ottorino Respighi - everybody knows his "Roman Trilogy", especially "Pini di Roma". A strikingly high number of Italian composers have avoided the "Neue Musik" style, e.g. Nino Rota, who got famous by writing film music but who also wrote orchestral and chamber works of highest quality. The second one to be mentioned here is Aldo Finzi, who was persecuted during the 2nd World War and whose excellent music has almost been forgotten. This composer was recommended to twentysound by an avid listener and supporter. Others are Goffredo Petrassi, who, although often using serial style, is fascinating to listen to, and Giorgio Federico Ghedini. Both are represented by selected orchestral and chamber works in the 9 Italy programs. Italian composers have excelled in the area of Guitar music, too - the key composer here is Mario Castelnuovo-Tedesco, who had to go into exile to America. Other composers for Guitar are Angelo Gilardino, Carlo Domeniconi and Franco Cavallone. Of course there are many other Italian composers which will be played in these programs, and surely many I forgot due to lack of knowledge. I am always happy to receive recommendations! Starting today, 25.10.2015, I will use this space for a bit of blogging, containing program announcements, short notes about interesting composers and much more! Before World War I, classical music was ruled by late romanticism, with various schools, both conservative and progressive, often focussed on national traditions of the composers' home countries. It was normal to present music of contemporary composers in concerts, and music critics discussed their works regularly in the art pages of newspapers. Composers continued to develop their styles even after WW I, often bordering on atonality, and incorporating new music styles like jazz. There was a wide bandwith of composers, from conservative to progressive. A small group of Austrian composers centered on Arnold Schoenberg, the "Second Viennese School", went further and developed new musical techniques using twelve tone rows, based more on mathematics than on musical senses. In the musical world, though, they played only a minor role. Then, World War II broke out. People had other things on their minds than the development of musical culture. After the war, the world was divided into two halves. The East began to follow the "Socialist Realism" doctrine already ruling the arts in the USSR even before the war. All arts, including music, were to serve the People, and had to be easily graspable and clear. Strangely, in a way this helped the classical composers in keeping contact with their audience. There was no race for modernity, and the audience listened carefully for any potentially regime-critical nuance in concerts. On the other hand, some composers were broken, imprisoned or even murdered. In Western Europe, two things happened. On one side, the youth started to get interested in American popular music, like Jazz or Blues, later Rock and Pop. On the other side, intellectuals (and composers) turned away from the past and fully embraced the musical techniques of the Second Viennese School. The term "Neue Musik" ("New Music") was coined to describe it. Cultural politics and probably also American secret services (ref. Frances Stonor Saunders book "Who paid the piper") supported this trend, to make the contrast with the suppressed Eastern Europe more visible. The pre-war generation of composers quickly faded into relative oblivion. In concerts, these composers were largely ignored. Instead, in concerts it became usual to "frame" works from the "Neue Musik" school with classical compositions, from Mozart, Beethoven or Brahms, to keep the concert audience from fleeing. In regards to recordings, it was easier for listeners to avoid "Neue Musik". At the same time, music critics influenced the culturally interested public to believe that only "Neue Musik" and its predecessors did really count in contemporary music, that all other musical styles were either kitsch or "movie soundtracks". The musical portfolio of concerts and recordings also expanded far into the past, due to the rediscovery of Ancient Music, often played using original instruments. In these years, in the view of the general public, a classical composer was usually seen as a composer at least 100 years dead. The wide field of the history of music distracted both musicians and their audience from contemporary works of all directions. The lost generation of composers also suffered through the lack of a proper name. Many composers of the early 20th century were labelled as "Late Romanticists". "Contemporary" does not really fit, as time moves on. The most fitting term is "Modern Music", which may also be misunderstood, though. A certain turnaround started in the late 1980's, when the East started to open. Dmitri Shostakovich, the most important composer of the USSR, was played more and more often in the West - some of his works were even used as movie soundtrack. The conductor Herbert von Karajan, High King of Classical Music in Germany, recorded the 10th symphony of Shostakovich. At the same time, late romantic, or better early modern composers like Gustav Mahler were rediscovered by the wider musical public. But the greatest damage was already done - the concert going public, a minority by now due to the dominance of popular music, was not any more used to the raw, rhythmic sounds of modern classical music. The youth, when introduced to classical music by the older generation, usually gets to know it in the form of Bach-Beethoven-Brahms classics, brilliant, but intellectually frozen in time. In spite of this, musical culture continues its development. The evolution of classical music has not stopped, many composers continue to cultivate it. A growing number of music listeners are interested in unaccustomed, fresh musical sounds. 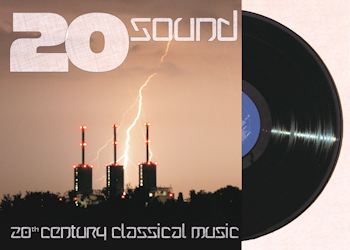 twentysound strives to contribute to the renaissance of this generation of composers ignored by the general musical public. We also want to help expanding the audience for composers of the current generation who follow the lines of those composers of Modern Music. Less important to twentysound is the comparison of different interpretations of a small "canon" of classical works by various conductors - we usually have only one version of a composition in our portfolio. We would like to ask all musicologists for excuse for this shortened and maybe a bit polemic summary of 100 years of musical history!